Although your feet may be hurting from all the dancing and you want nothing more than to put them up and waltz into the weekend, don’t ignore your skin’s silent cries for help…. Nine days of what is possibly the most animated festival in India have finally come to an end. As you scroll through images, marvelling at your superior make-up applying skills and choice of clothes, you can’t help but feel a little disconcerted at how patchy your skin feels right now compared to how radiant it looked under all those layers of cosmetics. Don’t go resenting your skin; this one’s on you. From eating all the junk your gut could stomach to consuming impossible amounts of alcohol, it should come as no surprise that your skin is acting up the way it is. Luckily, six of these homegrown beauty brands preempted this exact situation and have made arrangments to remedy it before you truly start panicking. Why we recommend it: Kama Ayurveda is known to transform the whole concept of bathtime and transport you back to a time when your daily shower wasn’t a chore but rather a leisurely activity that you took your time with. 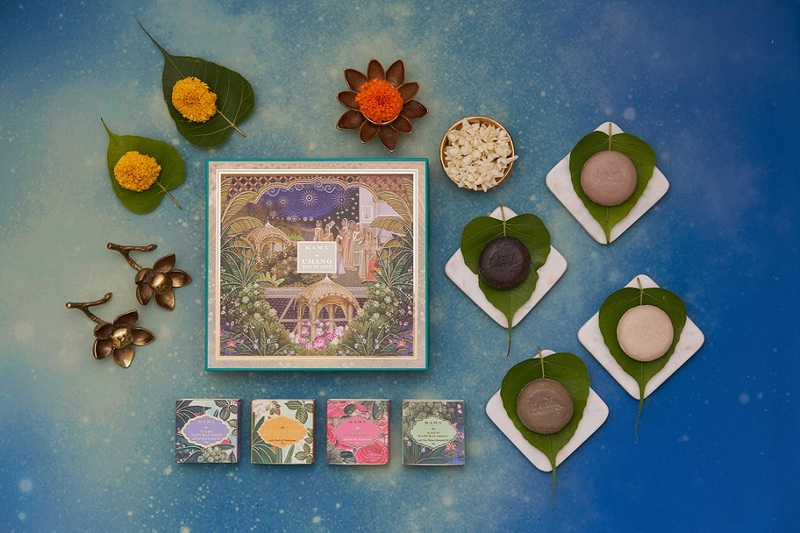 Christened the Umang box of love, their newest gift box is visually pleasing — as is the case with all of Kama Ayurveda’s products — as well as reparative. Comprising a rose soap, a tulsi soap, a haldi soap and a khus soap, the package aims at combating ageing, impurities, dullness and inflammation all at once. The cherry on top is the brass soap holder that will make you feel like you’re not in a modern-day bathroom but rather in a charming little hamam with handmaids waiting on you. 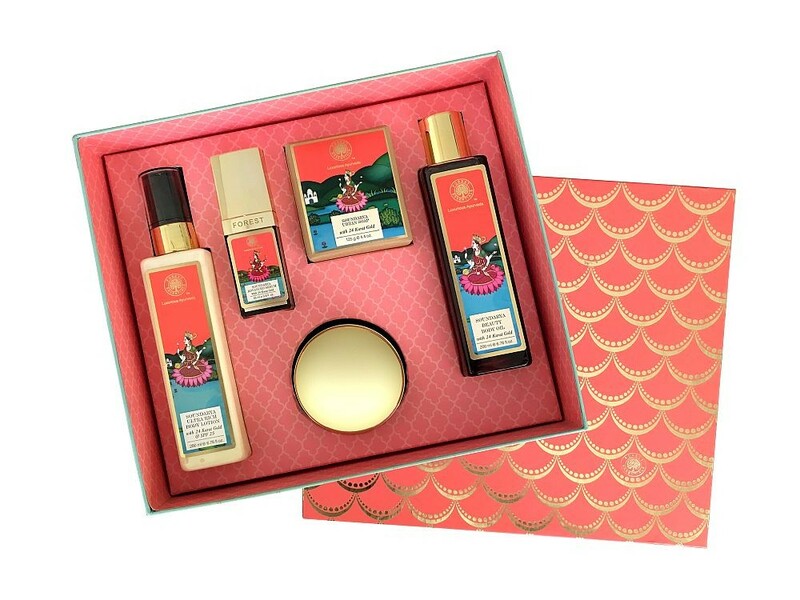 Why we recommend it: Another brand that places just as much importance on packaging as it does on quality, Forest Essentials’ Soundarya gift box is replete with products in bright hues that are inspired by the lotus-eyed Goddess Lakshmi. Borrowing from her ritual of using pure gold in her beauty regimes, the gift set features products infused with 24K gold that is designed to work its revitalising magic on your skin. In addition to the glow-inducing properties of the body oil, lotion, cream and serum, the ubtan will gently exfoliate and stimulate the underlying tissues of your skin that have been hiding under layers of makeup this past week. 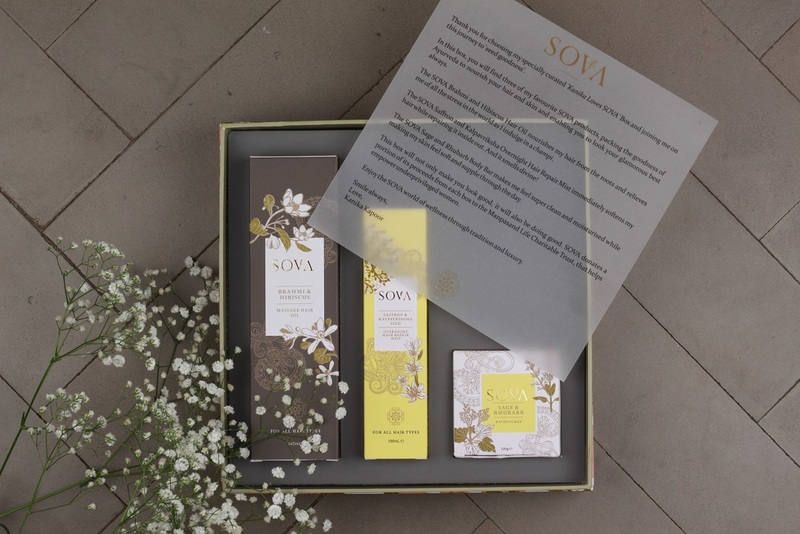 Why we recommend it: For the festive season, Sova has collaborated with Kanika Kapoor to launch a limited edition box that contains all the products that the singer herself swears by. Consisting of a saffron and kalpavriksha hair mist and a brahmi and hibiscus hair oil, the hamper is a complete package that will provide your tresses with all the nourishment it possibly requires from copious amounts of ironing and blow-drying — and the punishing October heat — you’ve subjected it to. It also contains a sage and rhubarb bathing bar that promises to gently detox your skin leaving it cleansed and supple. 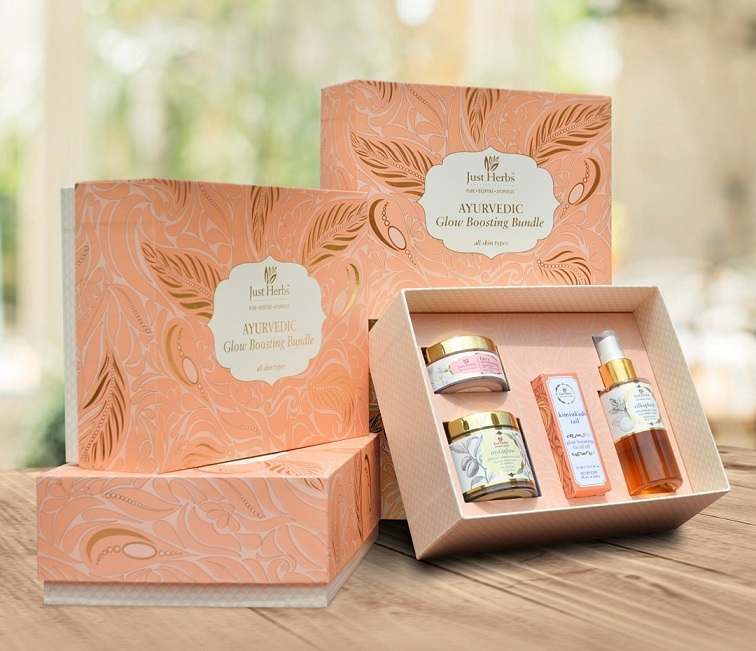 Why we recommend it: As the name suggests, this brand brings with it all the organic and Ayurvedic goodness that your skin has been craving in the form of a season-special hamper called the glow-boosting bundle that not only repairs your skin but also restores the glow to it. With products hand-picked from the brand’s six-step regime that are known to combat dullness and pigmentation, you will be set for the entire day with a face wash, a face pack, a lightening gel and a facial oil. An added bonus is that you don’t have to force-fit the products to fit your skin type because they are free from petrochemicals, parabens, GMOs and other harmful synthetic ingredients. Why we recommend it: As humans, we have come to realise that all the ingredients we require to survive in a healthy manner are to be found in nature itself and if treated with respect, Mother Nature is a gift that keeps giving. Ohria operates on the principle that all objects in the universe comprise five basic elements known as the Panchamahabhutas which can be balanced to bring out the best version of yourself, in terms of both health and beauty. Accordingly, the brand’s turmeric and saffron collection has anti-oxidant ingredients like sandalwood, orange peel and rose that brighten and revitalise the skin. You can even get in touch with the experts at Ohria for a Dosha analysis where they recommend products based on each of the three energies believed to circulate in the body and govern physiological activity, provoking a disposition to particular physical and mental disorders. Why we recommend it: Employing the combined power of Ayurveda, botanicals and western medicine, Dr Sheth’s has launched a collection of five products that are the perfect antidote for tired skin. These include the basic brightening daily cleanser, the indoor protection mist, the basic brightening sheet Mask, the date and quinoa eye cream and the antioxidant repair cream. 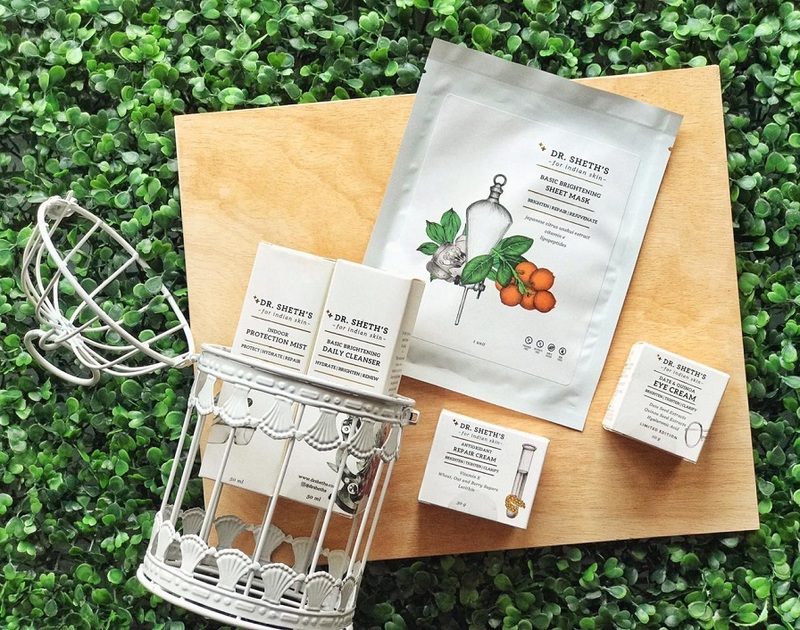 Packaged into a limited edition ‘Skin Repair & Rescue” kit, the products are designed to reverse the effects of stress and repair skin that has been damaged by excessive make-up.